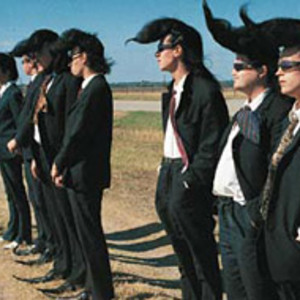 The Leningrad Cowboys are a Finnish rock and roll band, famous for its humorous songs and concerts featuring the Soviet Red Army Choir. Originally created as a label under which another Finnish band, the Sleepy Sleepers, could release their English songs and concert extravaganzas, the joke acquired a life on its own. Since its foundation in the late 1980s, the group has appeared in three films by Aki Kaurism?ki (Leningrad Cowboys Go America, Leningrad Cowboys Meet Moses and Total Balalaika Show) and also enjoys some success worldwide. Originally created as a label under which another Finnish band, the Sleepy Sleepers, could release their English songs and concert extravaganzas, the joke acquired a life on its own. Since its foundation in the late 1980s, the group has appeared in three films by Aki Kaurism?ki (Leningrad Cowboys Go America, Leningrad Cowboys Meet Moses and Total Balalaika Show) and also enjoys some success worldwide. Currently, the band has eleven Cowboys and two Leningrad Ladies. The songs, always somewhat influenced by polka and progressive rock, have themes such as vodka, tractors, rockets and Genghis Khan, not to mention folkloric Russian songs, rock and roll ballads and covers from bands as diverse as The Beatles, Led Zeppelin and Lynyrd Skynyrd, all with lots of humour. The sight of thousands of people singing along 30 years later to yellow submarine listen and decide.